Home > Blog > Perks of Meet and Greet Airport Parking. Perks of Meet and Greet Airport Parking. Every decent travel plan has a few bullet points. They may constitute little or appear small but are managing a great deal of your luxury traveling. Airport Parking, for instance, can be real bothersome if the parking reservations’ bullet is missing from your planner. Driving in an airport without any idea about how you are going to deal with parking can be a nightmare. So, while you are planning out your journey also give a thoughtful minute to what to do with your vehicle for the time period when you are away on your vacation or business trip. The most adequate solution to this is to reserve a dedicated spot for your car in advance. This way you have already chalked out your drive in scenario of airport parking. It also tends to save you a lot of valuable time. Time, that you can now spend by focusing on the cheerful thoughts of you tour. Sounds GREAT, right!!! A little beforehand perseverance on your part can spare you from entire set of unseen parking quibbles. 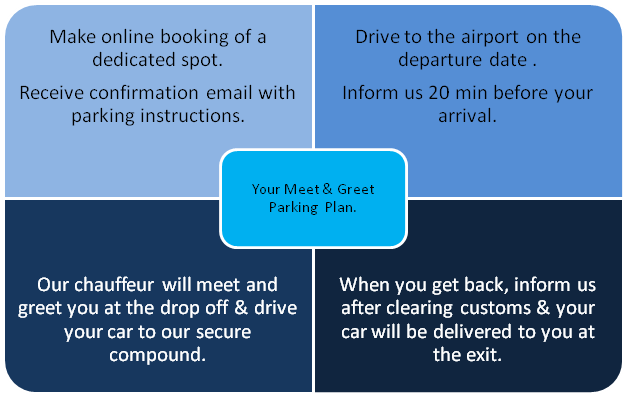 What does Airport Car Parking UK offers to facilitate you further? We provide assurance that all our agents, chauffeurs and drivers are professionals. They are expert in providing their skilled services. When we take custody of your vehicle, all the scratches, dents and other damages are cataloged. It facilitates the cross analysis when you get your car back. The chauffeur drives your car to a secure location of safe keeping. When you call & inform the service about your safe return, our chauffeur drives the car from our parking compound to the agreed upon spot and waits for you. After the short handier, you are green to go. We intend to gratify our customers by maintain a soundly structured parking facility. You can avail all this convenience by choosing to administer parking in advance. Safe travels to you all. Previous PostSteer Clear of Hazy Airport Parking.Next PostExemption of Travel Tax for Children at UK Airports.